Shortly after Felicia left in the fall of 2015, the Memorial started a search for someone with extensive experience in curating, grantwriting, historical research and an education background, particularly related to WWII and specifically D-Day. In October, the Foundation hired John Long as the new Director of Education. John previously served as the Executive Director of the Salem Museum and Historical Society and has taken over educational initiatives at the monument while working on evaluating the Foundation’s archival and artifact collection as the Memorial considers future plans for an educational facility. His experience is an incredible asset to the Memorial as we expand on-site and virtual programming in the coming year. Be on the lookout for blogs from him this spring on various artifacts in our collection and topics related to WWII and D-Day. Each year we host an event open to the general public called Prelude to Invasion that also serves as our annual Scout Day. 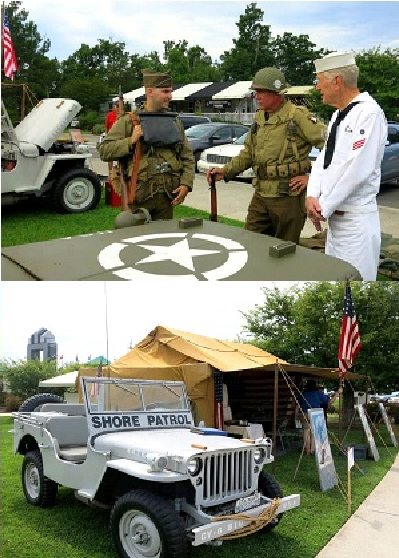 However in 2016, we are revamping this event to focus on the Allied preparations for D-Day through WWII era encampments, interactive activities with living historians, military gear, live 1940’s era radio broadcasts, and more! There will also be WWII veterans present who will share stories of their time in the war throughout the day. Our scouting component of the event is also more extensive this year with activities based on the Memorial’s values of valor, fidelity, and sacrifice, to earn a special patch featuring our arch. We are also offering the opportunity for Boy Scouts to complete a merit badge, Scouting Heritage, during this event for an additional fee. Prelude to Invasion: Meet the Allies will be on April 23, 2016 from 10:00-5:00 with discounted pricing of $4 for scouts and scout leaders who pre-register. Contact education@dday.org for more information. Another exciting development for Education at the Memorial is the expansion of our virtual programming. In 2016, we are updating our technology in our virtual studio and expanding our programming to cover topics that hit vital history curriculum standards, such as STEM in WWII, Minorities in WWII, and others. These upgrades will allow us to reach more classrooms and groups across the country, and even the world, through video conferencing to share the legacy of D-Day for future generations. This is only just a glimpse of what’s ahead, but I am excited for what 2016 has in store for the National D-Day Memorial and I hope that you are too! I am pleased to have discovered your fine blog, and I look forward to future visits and conversations.